Positions support HNTB’s growing number of tunnel and underground projects in the Western United States. Gordon Clark, left, was named West Division tunnel practice leader, and Mark Ramsey was named West Division tunnel practice construction management and delivery leader and vice president. They continue to build HNTB’s in-depth experience in providing innovative solutions through managing risks inherent to major complex tunneling projects primarily in the transit, rail, highway, aviation and water resources markets. 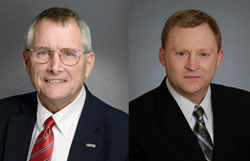 HNTB Corporation announced two new leadership roles on its national tunnel and underground team. Gordon Clark, PE, vice president, was named West Division tunnel practice leader, and Mark Ramsey was named West Division tunnel practice construction management and delivery leader and vice president. Ramsey is based in Los Angeles and Clark in Bellevue, Washington. Previously, Clark served as HNTB’s technical director-tunnels and complex underground structures, and Ramsey was the firm’s West Division tunnel practice leader. Clark has more than 30 years of experience directing the planning, design and construction of large, multidisciplinary civil infrastructure projects. He will continue leading complex designs, technical investigations, innovations, analyses, and construction of tunnels and underground facilities. He also will continue to lead a multidisciplinary group of technical staff in developing criteria, determining alternative alignments, providing innovative technical concepts and detailed designs for quality delivery. Clark is a member of the American Society of Civil Engineers, Society of Mining Engineers and American Underground Construction Association. He earned a Master of Science in structural engineering from the University of Texas at Austin and a bachelor’s degree in civil engineering from Oregon State University. Ramsey has 25 years of experience that includes tunnel engineering, construction engineering and management, planning, scheduling, cost control and cost projections. He will maintain his role as implementation manager for the program management team on the Bay Area Rapid Transit Silicon Valley Phase II project. This project is a 6-mile extension of BART to Santa Clara through downtown San Jose, California. The extension includes 5 miles of tunneling, three underground stations, one at-grade station, a storage yard and a maintenance facility. Ramsey graduated from Purdue University with his bachelor’s degree in construction engineering and management. He is a member of Underground Construction Association of SME and the Transportation Research Board Tunnel and Underground Construction standing committee. The firm’s tunnel projects range from small-diameter excavations to the largest machine-bored tunnel in the world. Some of the nation’s most complex underground projects have benefited from HNTB’s award-winning planning, design and support services, including the Crenshaw/LAX transit corridor in Los Angeles; Presidio Parkway in San Francisco; Devil’s Slide Tunnel in San Mateo, California, the Washington Dulles International Airport tunnels, and the SR 99 Alaskan Way Tunnel project in Seattle.